Beau's wisdom and kindness shine through his eyes. Anyone who has lived in Southern California for any time has probably seen a picture of Karen Malcor-Chapman's Khornerstone KpM (Khemosabi++++// x Shahntu), known as "Beau" to his friends, in the house watching TV. How did this come about? Karen explained, "Someone bet me that there were no more 'live in your tent' Arabians any more. So I brought my (at that time) 3 year old stallion Beau into the house. There's a video on YouTube as proof." Beau has extremely good taste in television, and can be seen eating popcorn and watching "The Black Stallion," perhaps taking notes. Asked about Beau's career, the versatility and good mind of this Khemosabi son becomes evident. 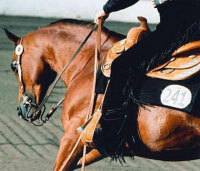 "Beau was trained and competed in reining for five years. 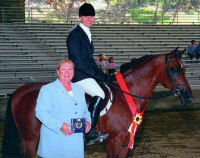 Beau went Reserve Champion Hunt Seat Pleasure with a catch rider and reining sliders on. 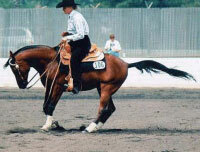 He went on to win the reining competition two classes later." Beau showing his hunt seat style. Add to that two Regional Top 5s in different regions in the same year, some halter and costume wins, and you have quite a range of talent. He's also been a breed ambassador at the Equine Affaire. Not satisfied with those accomplishments, Beau's been dabbling in dressage the last 1 ½ years and will hopefully be competing in the near future. For this very reason Karen's motto is "What Every Arabian Should Be." She feels people need to know that these type of horses are what the breed is about. Karen's had some health challenges, and Beau is always the horse she gets on when she wants to ride—even if it's been a while. "He always takes care of me." Khalvin Khlein KpM at his inspection. At age 19 Beau still has the cleanest hocks her vet has ever seen. He also has a 100% conception rate year after year, and at 15.1 hands, he adds height to mares, too. All of his foals who have gone to Regionals or Nationals have placed, although most of his foals are family friends and trail companions. 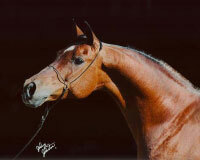 Beau's son, Khalvin Khlein KpM, was exported to Germany, and is the only approved champagne colored stallion in Europe, according to his owners. He's known for his scopey jump and exceptional trot. 2011 brought the birth of the first double-Beau foal. He's a handsome bay colt named Sparkling Cider. She's so pleased with this cross, she's going to be repeating it in the near future. She currently has a full sister to his National Top Ten Sport Horse in Hand Amateur-to-Handle daughter, so be sure to watch for her, too. One of Karen's friends sums it all up, "He's one of the special ones--more person than horse."